Motor data is now key in how we drive and how we care for our cars. If you haven’t yet heard of Big Data, then hello and welcome to the 21st Century – was it a pleasant trip in your time machine? And how was Queen Victoria when you left? Big Data is the gathering and analyzing of every little bit and byte that we record in our daily lives, and looking for patterns within the morass. It is, like so much modern science and technology, a double-edged sword. Big Data can be incredibly useful and helpful, but it can also open the gates of mass monitoring and targeting of specific consumers both for advertising and for extra costs. In motoring, Big Data is becoming more and more important by the day, especially when it comes to two things; how we drive and how we care for our cars. An Irish company, Luminosity, has recently developed a compact low-power chip that can be tucked away inside the car and the motor data on it read with nothing more complicated than a smartphone. Originally designed to make stock taking much quicker and more simple for companies importing and storing large numbers of cars, it has grown far beyond that original remit. After all, it’s a digital chip – almost any information you like can be encoded on to it. Right there is the double-edged sword. We could replace our awkward and vulnerable paper discs for insurance, NCT and road tax with a single, tiny chip. Not only would that make it easier to protect against fraud and tax evasion, but it would have other, smaller beneficial effects too. How about freeing up that footling space in the windscreen to make seeing out that little bit easier? Better yet, the chip can also contain the car’s full service history, which a potential buyer could access with the simple swipe of their phone. No more torturous checking with the owner, the vendor, the garage which used to work on it. You could see right there in the palm of your hand whether or not the car you’re thinking of buying has had is timing belt done. Or its last service. Or any service, for that matter. The downside is also right there in your palm. If you’re swiping the tag, then it’s easy for companies to see that you’re interested in that particular car, and targeted advertising will suddenly flow your way. Special offers, discount vouchers, maps to other dealers selling similar models. All of which can be useful, it’s true, but all of which can be hugely irritating as anyone who’s cleaned out their email inbox of a Monday morning knows. That’s small beer compared to the legal can of worms waiting for us over in the dash-cam section. 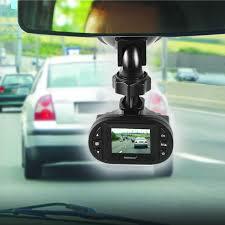 Dash-cams, small video cameras that can be fixed to the inside of the car, looking out through the windscreen, have become ubiquitous in some countries. Google Russian dash-cams and sit back, prepared for an afternoon of horror and hilarity on YouTube. The Russian market has gone dash-cam mad simply because the roads are so dangerous, and the police so uncaring, that individual drivers have to have some undeniable record of what’s happened to them in the event of a crash. It’s the only way to get satisfaction in court in some cases. And the popularity of such devices is growing here too. Jon Oliver, Halfords’ technology category manager says: “This huge increase in sales has shown that dash-cams aren’t just for shows like ‘Police, Camera, Action’ – our savvy customers are taking advantage of the lower insurance premiums on offer and are looking for peace of mind against knocks and scrapes while on the road. We predict dash-cams will soon be seen in every car, going from a niche gadget to a driving must-have.” In fact, some UK insurers are now offering discounts for those that fit a dash-cam, because of how much it speeds up the legal process in the event of a dispute of fault over an accident. Anything that trims a few minutes from the lawyers’ meter has to be good, right? Well yes, clearly dash-cams have their utility but the downside is that we could all shortly be compelled to have one fitted to our cars, constantly recording our behaviour and our driving. Bad enough that your insurance company may well base your premium on such records, but worse if you are required to submit footage from the dash-cam as evidence in court against yourself. The old ‘no man shall be compelled to give evidence against himself” argument has been tried but it won’t stand up in court – if a person’s phone records can contribute to them being convicted for murder, then your dash-cam footage can certainly be used to prove that you were speeding. So; Big Data – good and bad. It can be hugely useful to us when we are looking for a good used car, or for when we are the injured party in a legal dispute. But not so good when we’re being flooded with messages on our way to do community service, having been dobbed in by our own technology. Use with care.